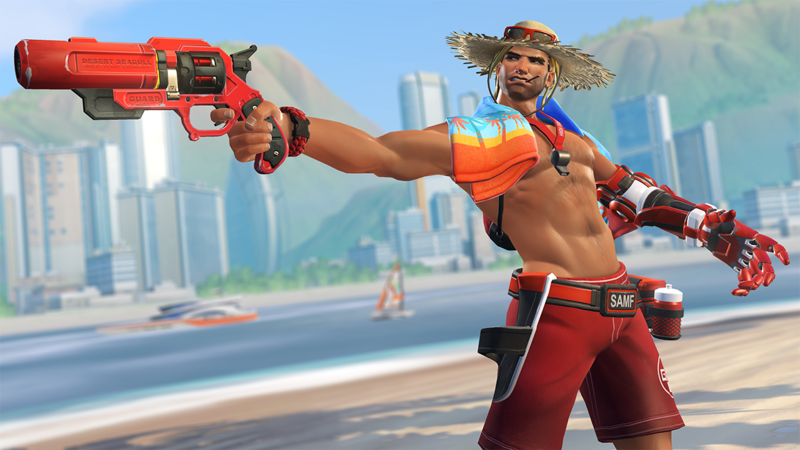 This is more a parody and a quick joke of an article, but seriously a summer-themed Overwatch round of skins and the best they could come up with was a meh at best Widowmaker and a lifeguard McCree?! Okay fine, I’ll admit that skin’s pretty sweet (here), but still! No Tracer, D’va, hell where’s Winston in his ridiculous summer get-up?! At the end of the day, go all the way or go home and it appears that not every character got a skin, which I think is dumb. So for shits and giggles (and because I love swimsuit DLC for every character, not just the girls!!! ), let’s go through all the amazing fan art we’ve seen made of the various characters and pick the best summer-themed skin for each character! So there you have it, my totally 100% real and absolutely serious ideas for what Overwatch should’ve done for this year’s summer-themed skins and such. Okay in all seriousness, it’s always cool when Blizzard pops out new skins, but I was hoping for a little more, especially when Widowmaker’s skin showed up in my feed. We need to stop getting all offended at swimwear like it actually matters in the context of the game. Even the most serious people take off their normal clothes and suit up in swim trunks and bikinis once in a while, folks! So why not the Overwatch cast? Seriously though, that Pharah/Mercy picture. Hot damn!